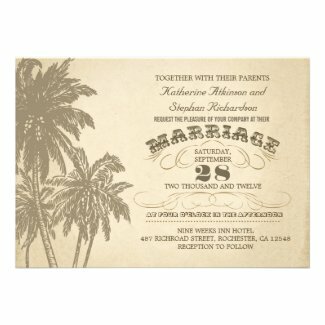 This tropical collection of Custom Palm Tree Wedding Invitations are perfect for any beach themed or destination wedding. You will find a great selection of both formal and casual invitations. There are many styles available from vintage to modern. Click each invitation to view additional details and personalize. Take a look at the following sites for a great selection of Tropical Palm Tree Beach Wedding Supplies.